1. Acting Southern Area Manager, Maureen Wanu cutting the ribbon to officially hand over the renovated classrooms as Taurama Barracks Commanding Officer, Boniface Aruma looks on. 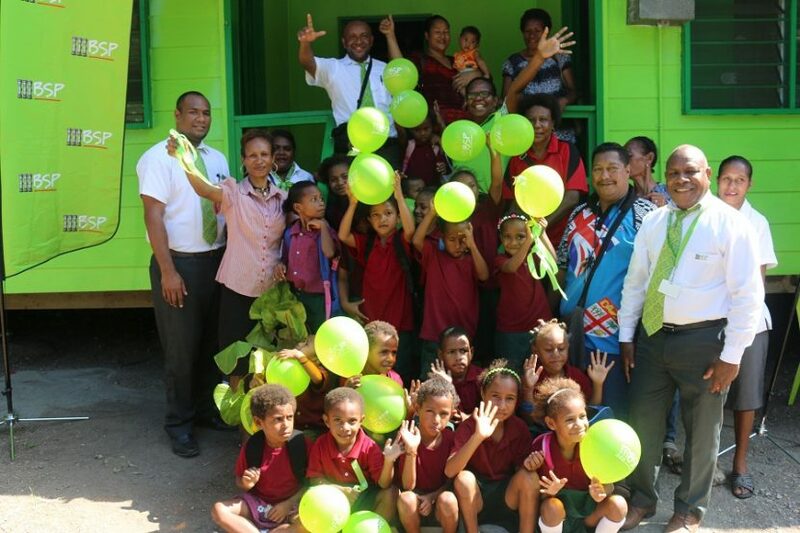 WEDNESDAY 19th JULY, 2017| Pre-Schoolers at the Taurama Barracks will now have a clean, friendly learning environment, thanks to Bank South Pacific (BSP) who renovated their two classrooms. 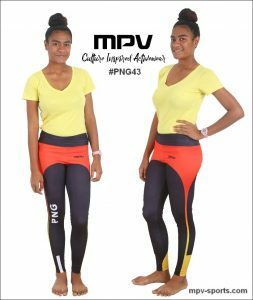 This was part of the bank’s community project initiative that was executed and delivered by the staff at Waigani Banking Centre (WBC) on Wednesday 19 July, at the Taurama Barracks, Port Moresby. Staffs volunteered to work during the weekends to clean up and wash down the building walls in preparation for the contractor to do renovation. They also took time to assist in painting the two classrooms, ablution blocks, fence and the playground after the renovation was completed. The Taurama Barracks Pre-School was established in 2006 to serve the growing population of young children in the barracks. This was the first renovation done for the school after 11 years of operation. The School’s Head Mistress, Mrs Margaret Ume, thanked BSP for choosing the Taurama Barracks Pre-School, out of the many schools in Port Moresby. 2. Staff from BSP Waigani Banking Centre and the Projects Contractor posing with excited Students, Teachers and parents from the Taurama Barracks Pre-School in front of their renovated classroom. “We believe in guiding these young children with the values of respect and honesty. These are common values that we share with BSP,” said Mrs Ume. “On behalf of Taurama Barracks preschool, the children and parents, we thank you BSP for supporting the future of our children with this kind gesture that will enable our young minds to learn in a friendly atmosphere,” she said. The completed project was handed over to the Commanding Officer for Taurama Barracks, Boniface Aruma, by Maureen Wanu, Area Manager – Southern Region and witnessed by staff and the community. We trust that creating a new look for the buildings and the environment will boost staff morale and encourage the children to learn well,” said Ms Wanu. 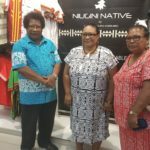 The handing over of the project makes a total of nine completed projects out of the 48 community projects to be delivered by BSP throughout PNG this year. 3. Students from the Taurama Barracks Pre-school presenting an item to the BSP staff. Bank South Pacific (BSP) is an iconic and unique bank in Papua New Guinea and the Pacific, recognised for its strong commitment to the region. 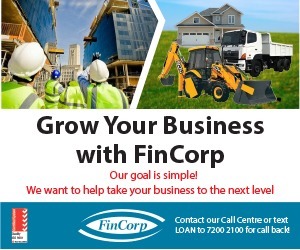 We are a major commercial banking and finance group with assets of approximately PGK20.8 billion. 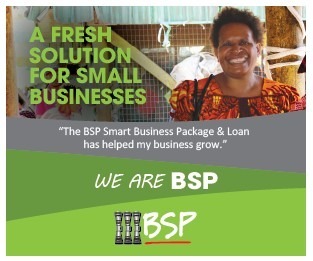 BSP has the largest branch network in Papua New Guinea, Cook Islands, Fiji, Samoa, Solomon Islands, Tonga and Vanuatu with sub branches and agents in rural locations. The BSP Group employs 4000+ people across the Pacific and proudly supports the communities that we operate in, through Community Projects, Sports, Education, Health, Culture and Financial Literacy. Our branch network is complemented by electronic banking networks that can meet the banking needs of all customers wherever we operate. We’re proud of our whole of bank capabilities whereby our teams in Corporate, Retail, Paramount and Treasury are able to provide solutions to our clients, drawing on our capabilities and broad presence. This capability is unmatched by our competitors. 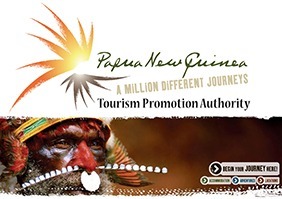 PNG and the Pacific is our home. We have knowledge, history, experience and a commitment to the region that other financial institutes cannot offer.